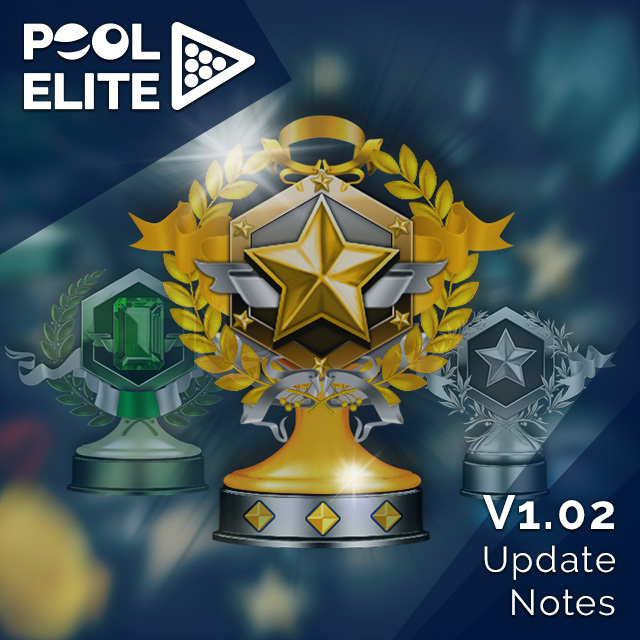 ﻿ Pool Elite V1.02 Update is live! Seasonal League system is started in Pool Elite! You will be rewarded monthly according to your highest division in that season. The end of season payout will be higher if you advance a higher division. Each season will end at the end of the month and a new season will start on the following day. You can check your Seasonal league information from League > Seasonal menu on lobby. We all like achievements, right? Your achievements in Pool Elite will be immortalized as permanent trophies and these trophies will be kept in trophy room being added to your player profile. Reaching specific levels, winning 100th match, competing in seasonal league will bring you permanent trophies. An average score of players will be shown at the scoreboard in Carom and 3-Cushion game modes. This was one of the most requested features by our players and now we have it in our game. *Auto Close Spin Ball: When you enable this setting, the big spin ball will be closed by itself after setting it. With the update today, this feature is enabled by default, you can disable it from Settings>PRO Settings menu. *Power Bar Indicator: When you enable this setting, you will see the numbers on power bar in-game instead of bars with cue stick. We were receiving some questions related with the items in Lucky Spin. To make it more clear, we made Lucky Spin interactive to use. You can drag the items to left and right, click on them to preview. Check out this feature now from Market > Lucky Spin menu. Your feedback about this update is important to us, please keep sharing your opinions as comments. If you find a bug or issue, don’t forget to report it to us. We will fix it as soon as possible.